Before we talk about the ThinkPad Tablet 2, Lenovo's new Windows 8 hybrid, we need to talk about the original ThinkPad Tablet, the one that came out in fall of 2011 to mixed reviews. It was an okay device, when push came to shove, with useful features like a full-size USB port, 1080p output and pen support -- a rarity on Android tablets. But the tablet itself was bulky, performance was sluggish, battery life was mediocre and there weren't even that many Android apps designed to be used with a pen. It was a concept that didn't totally work -- at least not with that OS -- and indeed, Lenovo's long since discontinued it. Fast-forward to the present, and the ThinkPad Tablet's been resurrected in the form of a 10.1-inch Windows 8 device, one that starts at $579 and can be used with an optional keyboard dock. It's a much lighter product, at 1.3 pounds (down from 1.58), and although it uses a heavier-duty Atom processor, battery life is said to top out at about 10 hours. (The original lasted eight in our usual test.) Like the OG version, it allows for pen input on select models, but of course, Windows comes ready-made with a larger selection of apps where a pen might actually be useful. So is the second time a charm? In a word, yes. The ThinkPad Tablet 2 is the best low-powered Windows 8 tablet we've tested, thanks to its 10-hour battery and an unmatched typing experience. 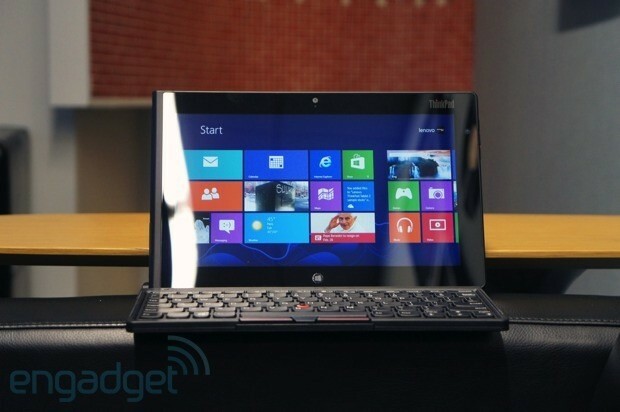 How would you rate the ThinkPad Tablet 2? The ThinkPad Tablet 2 doesn't have all that much in common with the original -- the first ran Android and this one's powered by Windows 8; one was a bit of an odd duck and the other is our favorite thing since sliced bread. 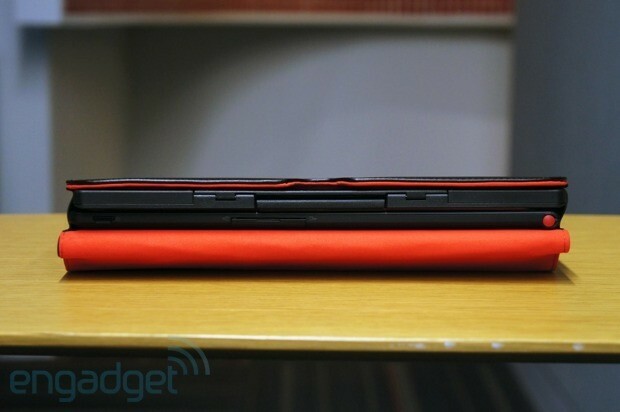 If nothing else, though, they both look exactly the way you'd expect a ThinkPad slate to look. Which is to say, this new ThinkPad Tablet 2 has a rubbery, soft-touch finish, similar to the coating used on Lenovo's various business laptops. Even the ThinkPad logo with the glowing "i" has been replicated here. If you order a tablet with a dual digitizer, the included pen has a red cap, modeled after the ol' TrackPoint. The optional Bluetooth keyboard dock is also styled like a typical ThinkPad keyboard, but let's not get ahead of ourselves -- we'll discuss the typing experience in excruciating detail later on. First, though, the tablet. It's remarkably comfortable to hold. We're not sure if it's the soft-touch finish, the rounded edges or some combination thereof, but the ergonomics here are nearly perfect. The left landscape edge is extra curvy, since it makes room for the slot where the pen is stowed. That means, dear reader, that you get a little more space your left thumb, and you get to rest that finger on rubber instead of glass, to boot. The device feels lightweight, too, at 1.3 pounds and 0.39 inch thick (that's lighter than the current iPad and about as thin, for those keeping score). Meanwhile, the tablet's soft edges make this easier to hold than either of the boxy Surface tablets, though we'll admit neither is a direct match for the ThinkPad Tablet 2 -- at least not in terms of performance. If we're going to continue our tour of the device, we may as well pick up where we left off: near the pen slot. The pen's got a notch attached up top, with a series of grooves allowing you to lift the pen out of its hole using your fingernail. We're happy to report the damn thing stays put, but wresting it out of its slot can take a bit of practice. A little farther down on that same side is the full-size USB 2.0 port, covered by a pull-out door. Unfortunately, while that's normally a nice feature to have, the 2.5-watt socket here doesn't work with either USB hard drives or external optical drives, even when the tablet is plugged in. In theory, though, that's a problem you could solve buy using the USB port on the optional docking station. There's also a micro-USB socket, which you'll need to charge the device (you can't use it to transfer data, Lenovo says). Since this is a standard sort of connection, you can supply your own cable, which you might want to, since the one that comes in the box is awfully short -- i.e., it won't reach from a desk to an outlet on the floor. Over on the right landscape edge you'll find various essentials: a headphone jack, volume rocker and power / lock button. Up top (we're still in landscape mode here), there's another covered door, this one hiding a microSD slot and a SIM card slot. In the US, at least, you can get LTE, courtesy of AT&T, but in other parts of the world you're looking at HSPA+. On the bottom side you'll find HDMI output, along with a docking connector. No surprise here: there's a physical, requisite Start button on the bezel below the screen. Lenovo also stuck an NFC radio under the hood, in case you happen to have handy another device that's capable of Near-Field Communications. And what would a tablet be without cameras? You've got a 2-megapixel one up front for video chatting, and an 8MP shooter with flash around back for more-detailed stills. 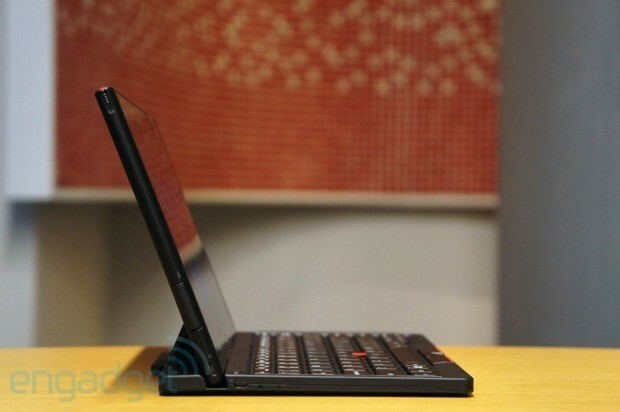 Purchase the ThinkPad Tablet 2 by itself and you've got a nice a slab of metal and glass. Buy the $120 Bluetooth keyboard, though, and you've got yourself a real ThinkPad. The six-row layout here isn't an exact replica of the one you'll find on Lenovo's new laptops, but it's pretty damn close. The keys have the same U-shaped "Smile" design, with a healthy amount of space separating them -- an impressive feat when you consider the keyboard is about as small as a netbook's. The buttons are dense and cushy, backed up by a sturdy panel that can withstand even the pushiest of typists. As you might expect, some of the buttons have been shrunken down to the size of fingernails -- in particular, we often missed the Backspace key and hit Delete instead. Still, most of them are easy to find without looking -- even the little arrow keys squeezed into the lower-right corner. Most importantly, though, the keys feel like a real ThinkPad's: if there is in fact less travel here, we can barely tell the difference. 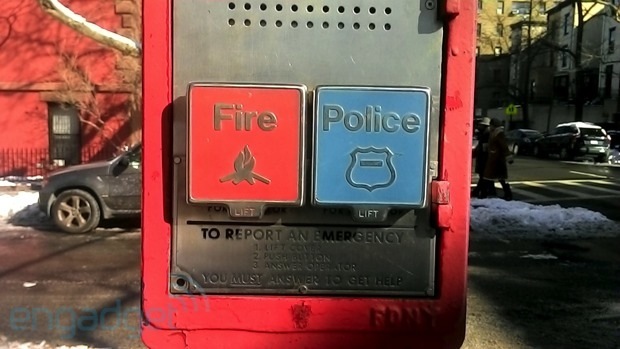 These buttons are dense and cushy, backed up by a sturdy panel that can withstand even the pushiest of typists. It's easily the best keyboard you'll find on a hybrid device -- the sort of thing you can use to get some real work done. Most of the time, anyway. Occasionally, we experienced some lag over the Bluetooth connection, which caused letters to appear on screen many seconds after we typed them. There's not much you can do when that happens, save for flipping the power switch and re-pairing the keyboard to the tablet. The dock doesn't allow you to adjust the tablet's screen angle at all, though fortunately glare was never much of an issue. You can rest it in your lap too -- the weight distribution is such that the device isn't likely to topple over. But if it does, out goes the tablet: there's no physical latch mechanism to keep it in place. You'll also need to charge the keyboard separately, though it at least uses the same micro-USB standard as the tablet, which means you can swap the same cable back and forth if you only have one on you. That's fine (so is choosing to always have two micro-USB cords on hand), but we think we would have preferred a latch-style keyboard, preferably one with a built-in battery. That way, we'd be able to charge both devices at once and get a little extra runtime while we're at it. At this point, it might sound like our write-up about the keyboard has taken a sour turn, but in fact we like it quite a bit. And it's not just the buttons that won us over; it's also the optical touchpad taking the place of the usual TrackPoint. The best way to think about it might be to compare it to the optical touchpads on BlackBerry devices of yore. There's no "stick" here to bear down on, to push from left to right. Instead, you run your finger over the surface, as you would the touchpad you have on your laptop. And it works well. Very well. Tracking is precise, and the two touch buttons are placed in such a way that they're very easy to reach with your thumb. There's even the usual third button for fast scrolling, which is interesting since Lenovo just got rid of all the buttons on its ThinkPad touchpads. In addition to that $120 Bluetooth keyboard, Lenovo is offering a bunch of other accessories. These include a $40 case with two slots: one for the keyboard and one for the tablet. That's available in black and red. For $50, meanwhile, the Slim case is thinner (natch) and folds up in the back, transforming it into a stand. Need some more ports than that single USB 2.0 socket? Lenovo is also selling a $100 dock that adds Ethernet, HDMI and three USB connections. Rounding out the list is a DC charger ($20) and a VGA monitor adapter ($40). Like all other Atom-powered hybrids, the ThinkPad Tablet 2 has a resolution of 1,366 x 768 (if you want 1080p you're going to have to step up to i5, or maybe give AMD a shot). As we've said many times before, though, pixel count isn't everything: we rather like the screen here, as the IPS technology makes for some wide viewing angles. We didn't have any problems with glare, and the fact that the screen is easily viewable also means you can probably get away with using it in your lap -- even if you can't adjust the screen angle on the Bluetooth keyboard dock. The only area where it stumbles is in outdoor use: even with the brightness pumped all the way up, we could barely frame a photo in direct sunlight. As it happens, the configuration we tested had a dual Wacom digitizer with support for both finger and pen input. That's not a standard feature, though: Lenovo is also selling finger-only versions that don't come with a pen (or even a slot for a pen). If you want to do some scribbling, models with dual digitizers start at $50 more. So which should you get? A little pen input is better than none, we suppose, but we have to say: the writing experience here just isn't as smooth as what you'll get on other Windows 8 devices, like the Surface Pro or ASUS TAICHI 21. The pen is technically pressure-sensitive, as we found while goofing around in Fresh Paint, but it felt like it was registering fewer degrees of sensitivity than other pens out there. Even with writing, we found we had to push a little harder than we would on those other tablets. For what it's worth, though, most Atom-powered hybrids don't even offer pen support as an option, so if you want both long battery life and the ability to doodle now and then, this might be your best bet. What's more, you at least get the ability to customize how the pen actually works; using the included QuickSnip application, you can program the pen's button so that it works for either right-clicking or taking screen captures. Considering the ThinkPad Tablet is, well, a tablet, the volume here is surprisingly sufficient, especially in quiet spaces like a den or conference room. When it was just us listening, we usually had the volume somewhere between the 50 and 75 percent mark, which meant we had a good deal of overhead if ever we wanted to crank a song for a little extra emphasis. Quality isn't bad, either. Maybe we're just conditioned to mediocre tablet-grade speakers by now, but we had a pleasant time sitting back and listening to various rock and classical tracks. If you don't normally notice distortion on your laptop, you probably won't notice it here. And if you do, well, you probably have a Jambox or something handy anyway. The neat thing about reviewing Atom-powered hybrids is that they tend to have the same specs: a 1.8GHz Intel Atom Z2760 CPU, Intel HD graphics and 2GB of RAM. That makes it really easy for us to compare the performance in an apples-to-apples sort of way. Which is to say, the scores are nearly the same. In the disk benchmark ATTO, for instance, the ThinkPad Tablet 2 turned in nearly the same numbers as the HP Envy x2 and the Samsung ATIV Smart PC. Its PCMark 7 score was also virtually the same as the x2's. In any case, as we've said many times before, while Atom might not cut it for gaming or complex photo edits, it handles the overhead of Windows 8 just fine. Swiping through open programs feels smooth, and programs are quick to launch. Not a single app crash to speak of, which we can't say of every single device we've tested. If you're doing a cold boot, it'll take about 15 seconds for the tablet to launch into the Start Screen, which is maybe three to five seconds behind what you can expect from a faster Core i5-powered hybrid. Sounds reasonable to us. What's more, the fanless design is also mostly successful in keeping the heat down: after an hour of surfing in IE10, the upper corner of the back panel was warm, but not at all hot. Lenovo says the tablet is good for up to 10 hours of battery life. Typically, we find those battery life ratings are best-case scenarios at most, if not complete fiction. 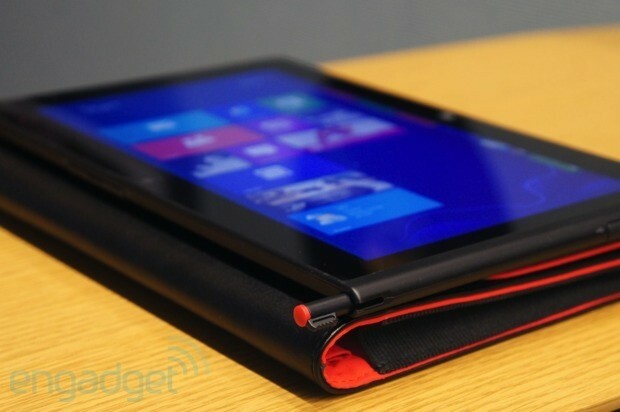 But the ThinkPad Tablet 2 actually lives up to its maker's claims, and then some. In our standard rundown test (video looping, WiFi on, fixed display brightness) we got 10 hours and 27 minutes of runtime -- far more than what we've gotten on any other Atom-powered Windows 8 tablet. Technically, devices like the Acer W510 and HP Envy x2 offer longer runtime, but that's only when you factor in their keyboard docks, which have second batteries built in. The tablet's main 8-megapixel shooter is about on par with other tablet cameras, with a respectable amount of detail at full resolution and decent, if slightly muted, colors. Shutter lag seemed shorter than on other products, so you likely won't be waiting around quite as long for your shots to go through. Macro performance was a hit-or-miss prospect, though: some of our attempts at close-ups resulted in a sharp background and blurred subject. Essentially, the opposite of what we were going for. Of course, too, since this is a Windows 8 tablet, there's no way to adjust the focus. (There's nothing in the way of special photo filters or HDR enhancement, either.) Video, meanwhile, shows fairly minimum ghosting, though the mics are no match for wind and other distracting background noise. Keep that in mind before pulling this out at your next trade show. 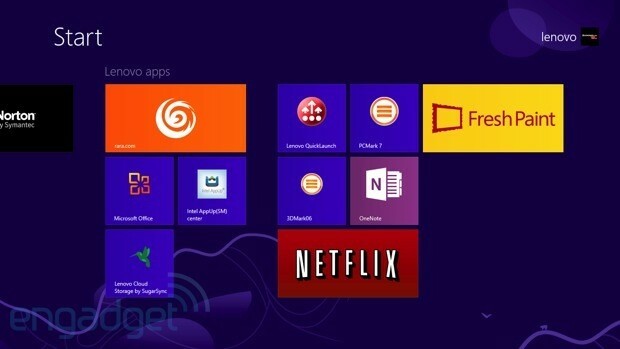 Compared to some companies (we're looking at you, Acer), Lenovo went easy on the bloatware. As far as third-party apps go, all you'll find is a trial of Norton Internet Security, as well as Skitch Touch, Evernote Touch, AccuWeather.com, Kindle, Skype, rara.com and Intel's AppUp store. Additionally, you'll find a few tame offerings from Lenovo itself, including Lenovo Companion, Lenovo QuickSnip, Lenovo Settings, Lenovo Support and Lenovo Cloud, which is actually based on SugarSync. And that's it. Between those apps and the OS, you should have 50GB of free space left on the 64GB model to install whatever you want. The ThinkPad Tablet 2 comes standard with a one-year warranty, which includes 24/7 phone support. If you like, you can extend the warranty to either two or three years, in which case you also get extended care for the sealed battery (a total of three years once you extend the main warranty). The ThinkPad Tablet starts at $579 with 32GB of built-in storage and the same 1.8GHz Atom processor and 2GB of RAM that we mentioned earlier. You won't find that model on Lenovo's site right now, but Lenovo has a history of not listing models that are out of stock, so if you browse the company's store and only find pricier models, don't despair. The 64GB, pen-enabled model is $679 while the 3G/4G version (also with pen support) costs a much pricier $949. Note that if you get the HSPA+/LTE model, it comes with Windows 8 Pro, and is missing the NFC you'll find on the WiFi-only models. 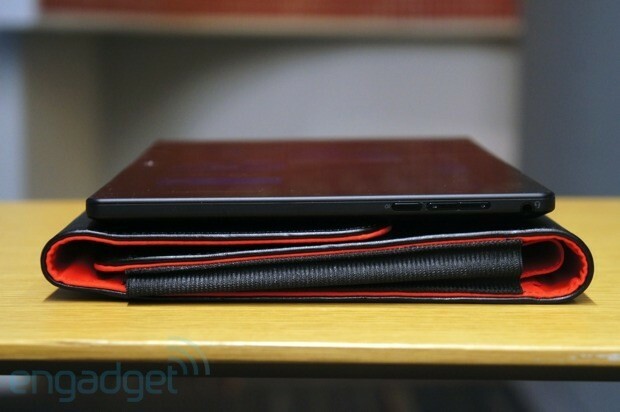 The ThinkPad Tablet 2 is the best low-powered hybrid you can buy right now. 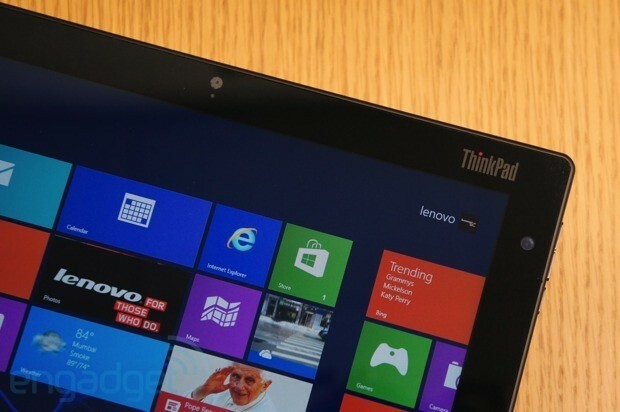 This is the part where we convince you the ThinkPad Tablet 2 is the best low-powered hybrid you can buy right now. Think that's presumptuous of us? Let's consider the evidence piece by piece. First up: the Acer Iconia W510. 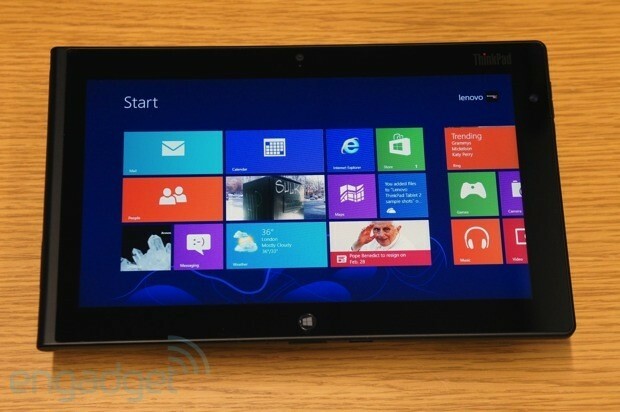 With a starting price of $550 in the US, it's one of the least expensive devices running Windows 8. The 10.1-inch screen is easily viewable from lots of angles. More importantly, the tablet offers fantastic battery life: more than 14 hours with the keyboard dock. But our praise ends there. The keyboard is cramped and ugly, a throwback to netbooks. Meanwhile, the HP Envy x2 costs more, at $850-plus, but the battery life is shorter and the typing experience isn't much more comfortable. For the extra money, at least you get pen support and NFC. Moving on, the Samsung ATIV Smart PC costs $750 with the keyboard included. Not a bad deal, seemingly, especially since this has pen support and comes loaded with the same S Pen apps you'll find on Samsung's Android-based Galaxy Note devices. Still, we had serious issues with the keyboard when we tested the LTE model -- not only was it awkward to type on, but it has a nasty habit of disconnecting from and reconnecting to the tablet, creating lots of annoying distractions along the way. There's also the Dell Latitude 10, which we haven't reviewed yet, but is available to purchase now, starting at $499 for the 32GB model. More tricked-out models have 64GB of storage, along with pen support, TPM, a fingerprint reader and a SmartCard reader. If anything, though, the ThinkPad Tablet 2's biggest competitor might be Lenovo's own IdeaTab Lynx, which has the same internals as the ThinkPad, except it has a bigger 11.6-inch screen, and the keyboard dock has a built-in battery. And though the keyboard is different than the one on the ThinkPad, it too looks promising, based on the brief hands-on time we've had (we're still hoping to do a full review). If you choose this, you should know it lacks NFC or pen input, but accordingly, the price is lower: $649 for the 64GB model versus $679 for the ThinkPad Tablet 2 with 64GB of storage and a pen digitizer. Until now, all of our recommendations of Atom-powered Windows 8 tablets have come with faint praise: most of these products have been marred by cramped keyboards, middling runtime and occasionally poky performance. Even the okay one, the Acer Iconia W510, is mostly saved by its low price and 14-hour battery life. It's otherwise no better than a netbook. 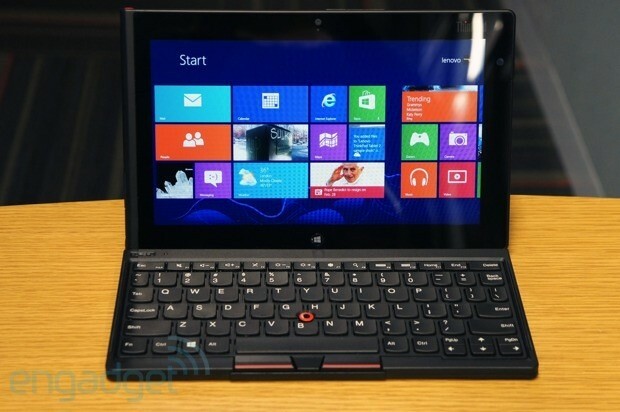 But the Lenovo ThinkPad Tablet 2 is different. It's seriously, refreshingly good. It's the sort of device we'd award an editor's choice... if Engadget did such things. Though the tablet was designed for business users, we'd go a step further and recommend it to anyone who's been looking for a Windows 8 tablet with great battery life. Truly, there's very little it doesn't do well: in addition to that long runtime, it offers stable performance and the best typing experience you'll find on a device like this. If there's one thing we'd have Lenovo address in the second-gen model, it would be the keyboard: the current one is great for typing, but a dock with a latch would allow for a second battery, and maybe adjustable screen angles. It would also eliminate any typing lag over Bluetooth. Unless you were hoping to spend a little less money, we can't think of a reason why you'd bother with most of these other low-powered hybrids. Even then, we'd recommend paying the premium: you'll be rewarded with a more pleasant experience in the long run.